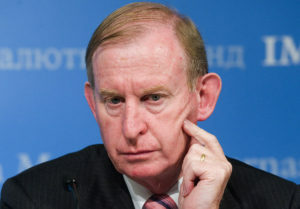 David Murray as AMP chair: are they kidding? You are here: Home / Investment News / David Murray as AMP chair: are they kidding? There has been lots of talk about AMP within the funds management and advisory sectors of the industry in recent weeks. Everyone, including insiders, has a story or two and has heard many more. Who was to blame; what can be done to save AMP? But the announcement that former CBA boss David Murray is to be the new chair left a lot of us speechless. David Murray, 69, is not from the funds management industry. He is a banker, as well as a self-professed climate-change sceptic. What do those facts tell us? For whatever reason, we’d have to think that David Murray’s track record, compared with the interests of Australian superannuants and investors, should have raised big question marks with respect to this appointment. Good luck to the poor institutional and wholesale BDMs at AMP Capital selling their investment products with Murray as their chair. What’s happening with AMP’s ESG strategies, for instance? Has AMP Capital, which should be seen as separate from its listed parent – and maybe will actually be so soon – fully integrated ESG in its processes? Can it handle a climate change sceptic former banker as a chair person? And how does Murray escape responsibility for the CBA culture which led to a string of scandals? The problems with AMP and the big banks are all about culture. AMP never really transformed from an insurance commission-driven culture. Successive chief executives and various directors were either unable or unwilling to build a new professional advice and fund manager culture for their financial planners and investment professionals. But why on earth would you appoint a new chairman who spent 39 years at the Commonwealth Bank, 13 of which were as chief executive? Murray’s time at the Future Fund, as inaugural chair, from 2007 to 2012, showed us that there were limitations with bankers who wanted to get into funds management and the startling differences between them and actual fund managers. He wanted, for instance, to get involved in many investment decisions, or at least express a view, even though, by its charter, the Future Fund has to use external fund managers. And Murray has never managed anyone else’s money. At the CBA, investment professionals did that. As an aside, Paul Costello, who was the highly regarded first chief executive of the Future Fund, introduced strong ESG principles to the organisation from the outset, as he did with NZ Super prior to that. Those principles have served the Future Fund very well. At the Future Fund, Murray famously refused to share his hire car with any of the Sydney directors who had to travel to Melbourne for meetings, even when they were on the same flight. At the Future Fund, Murray famously sent himself and a few other directors (called “guardians”) around the world, up the front of the plane, on various so-called study tours. At the Future Fund, the senior management considered Murray an impediment rather than an assistant in the fund’s development. The Future Fund, it has to be said, succeeded despite Murray rather than because of him. The Future Fund has had three chairs: Murray, David Gonski and the current one, Peter Costello. Gonski stopped the rot, as he considered it, refusing what he believed was wasteful international travel, for one thing, and introducing a proper board oversight of the culture. He realised Murray’s short-comings. And, subsequently, Costello has turned out to be an excellent chair, the management thinks. After Murray left the fund, in 2012, and was subsequently appointed to chair the Financial System Inquiry, industry insiders were surprised, again. It all came back to the CBA days. What happened there and how much has it contributed to the advice industry’s current woes? The big problem with Murray chairing AMP is his role in developing that CBA culture. The two most-reviled financial institutions in the country right now are AMP and CBA. Well, let’s get the bloke who used to run CBA to now chair AMP. What have they been smoking? “Murray was the Chief Executive Officer of the Commonwealth Bank of Australia between 1992 and 2005. In Murray’s 13 years as Chief Executive, the Commonwealth Bank transformed from a partly privatised bank with a market capitalisation of A$6 billion in 1992 to a A$49 billion integrated financial services company, generating in the process total shareholder returns (including gross dividend reinvestment) at a compound annual growth rate of over 24 per cent, one of the highest total returns of any major bank in Australia. “Murray holds a Bachelor of Business from the NSW Institute of Technology and a Master of Business Administration, commenced at Macquarie University and completed at the International Management Institute, Geneva. He holds an honorary PhD from Macquarie University and is a Fellow of the University of Technology, Sydney. He is an old boy of St Aloysius’ College, Sydney. By the way, in the good old days, when Murray got his undergraduate degree at UTS, that tertiary institution was referred to as “Sydney Tech”. He did not shoot the lights out academically. But he did do very well financially, at least for himself. He started his banking career as a teller in a little branch of the Commonwealth Bank at Lindfield, in Sydney’s leafy North Shore, in 1996, and stayed at the bank for 39 years. He went on to become managing director, for 13 years between 1995 and 2002, which is a very long time for the chief executive of a big bank. The cultural problems at the CBA, which were revealed even well before the Royal Commission, have his fingerprints all over them. So, putting aside whatever David Murray can do – which you’d have to think is very little in this context – what went wrong at CBA, and what went wrong at AMP? Maybe they are two long stories for another day. Russell thinks the APRA ‘Prudential Inquiry’ into CBA should serve as a lesson for other big financial institutions.